Bickerton, originally from Bournemouth, is the President of the BVI Football Association and has both played for and managed the national team during his 35 years on the territory. He said the FA is now “operating out of a shipping container” and has been “set back 10 to 15 years” after its headquarters were destroyed, while he has also suffered great personal damage. “By the end of the hurricane, I didn’t have a home anymore,” he said. Hurricane Irma also partially destroyed a new Fifa-funded artificial pitch in East End / Long Look, Tortola, on which the national team – ranked 205th in the world – were scheduled to play in CONCACAF’s League of Nations in September 2018. “It will be difficult as the players are scattered all over, in the USA, the UK and other islands,” Bickerton said. “But we will definitely enter the tournament. It has to be a major step for us in trying to recover. 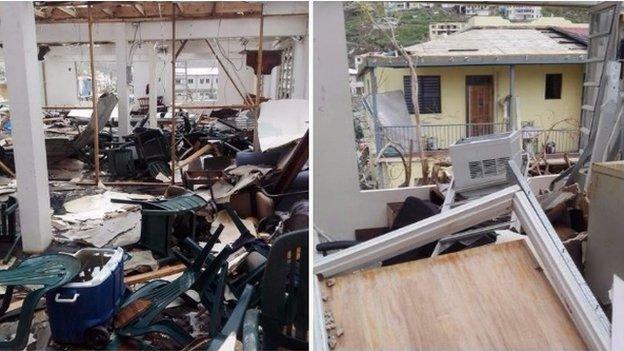 Bickerton said 50% of primary schools are not available for use, while the main high school on Tortola is also unusable after being badly damaged, adding that children are “working out of a hardware store”. The BVI FA has made the artificial pitch available for use to “raise morale” and it has restarted the afterschool program for youngsters remaining on the island. the Football Association staged a remarkable CONCACAF Women’s Day Celebration on Saturday 18th November, 2017, on the new Pitch at East End / Long Look.